This is the APR Ultracharger System. 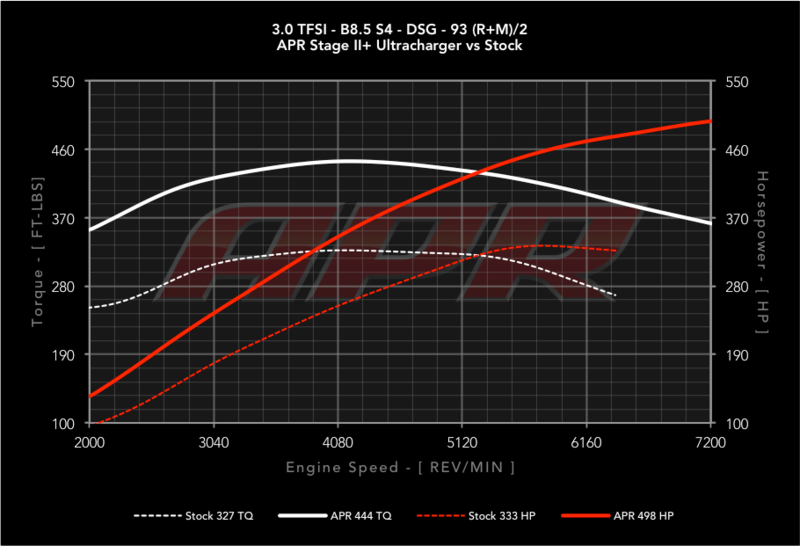 The APR Ultracharger System dramatically increases horsepower and torque, and maximizes the power potential of the 3.0 TFSI. It removes a massive pre-supercharger restriction, allowing uninterrupted airflow into the supercharger for up to an astonishing 542 HP with APR's Supercharger and Crank Pulleys. Stunning carbon fiber and smooth cast-aluminum adorn the system, creating a clean and simple install that looks just as powerful as it is. Finally, APR’s innovative Ultracharger ECU Upgrade delivers a smooth and exciting driving experience, and it is included as a free upgrade to all who own an APR Stage II ECU Upgrade. The factory throttle body is a massive power-robbing restriction. Its cross-sectional area is ~25% smaller than the supercharger’s inlet, causing airflow to plummet at high supercharger speeds. It’s responsible for losses as high as 33 HP! The APR Ultracharger Throttle Body is huge. Its cross-sectional area is ~28% larger than stock, and an additional 5% larger than the supercharger’s inlet. It completely eliminates the throttle body as a point of restriction and allows for maximum airflow into the supercharger. APR’s incredible Ultracharger ECU Upgrade is why it all just works. It delivers an outstanding driving experience, packed with a smooth daily driving, thrilling wide open throttle acceleration, and unmatched performance. It’s our most advanced 3.0 TFSI software to-date, and it’s included as a free upgrade to all who own an APR Stage II ECU Upgrade. 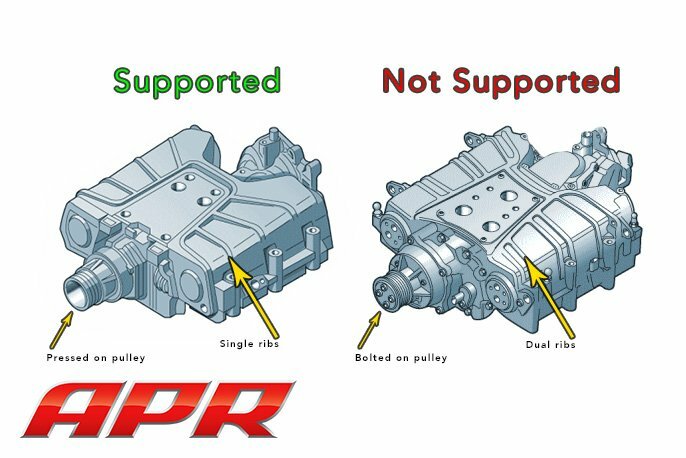 This upgrade is only applicable to superchargers with a pressed on pulley as shown here.APR’s Ultracharger ECU Upgrade is required. This included upgrade requires purchase of APR's Stage I and Stage II ECU Upgrades. - Pricing: Please contact for pricing outside the USA. - ECU Revision Notice: Multiple ECU revisions exist for each platform. APR software may be temporarily unavailable when factory updates are applied. We can check availability in person, or over the phone if the ECU boxcode/revision is known. This product is designed for use with APR's Supercharger Drive and Crank Pulley Upgrades, APR's S Tronic TCU Upgrade, included NGK BKR9EIX plugs gapped @ .024” +/- .002” torqued to 30Nm., and the APR Supercharger Cooling System. IAT’s must be below 75c to achieve the advertised power figures. A high flow intake system is highly recommended and is required to meet the advertised power figures on the A4/A5/S4/S5/Q5/SQ5. For the best results, APR recommends removing the intake snow screen. At these power levels APR does not recommend use of the factory catalyst. The APR Ultracharger ECU Upgrade MUST be installed before starting the engine.